The Washington Nationals have traded right-handed reliever Trevor Gott to the San Francisco Giants for cash. 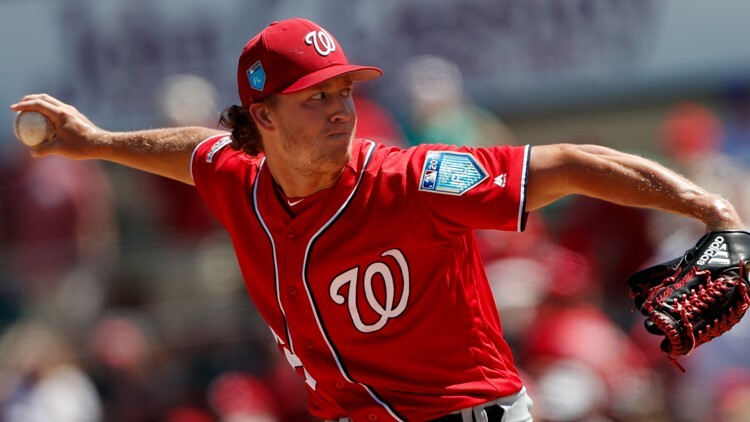 WASHINGTON — (AP) - The Washington Nationals have traded right-handed reliever Trevor Gott to the San Francisco Giants for cash. Wednesday's move comes after Washington designated the 26-year-old Gott for assignment to make room on the 40-man roster for starting pitcher Jeremy Hellickson. Gott went 0-2 with a 5.68 ERA in 20 appearances totaling 19 innings for the Nationals in 2018, with 15 strikeouts, 10 walks and four home runs allowed. He is 5-4 with a 4.64 ERA in 81 games, all in relief, since making his major league debut in 2015 with the Los Angeles Angels.